Z Day: Hearts of Heroes is an amazing war strategy game developed by KingsGroup Holdings. 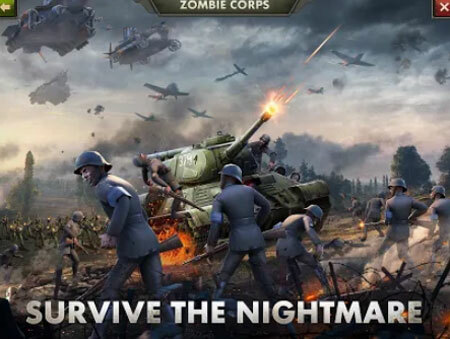 As a Commander in hostile territory, you must build your army, fortify your base, make friends and take out enemies while trying to survive an apocalyptic zombie war zone. The Commandant has proved he will stop at nothing to achieve victory. You must use all your cunning to repel the Invasion and save humanity from oblivion. Manage your resources, train your army and research vital skills. Understand your enemy and strike strategically. Build yourself an Empire strong enough to survive the war to end all wars. The game features fresh immersive storyworld packed with terrifying Invaders and stunning HD graphics. If you get stuck in the game, check out the video walkthrough and gameplay for the game. This entry was posted in Android Games, iOS Games, Mobile Games, Walkthrough and tagged Z Day: Hearts of Heroes Cheats, Z Day: Hearts of Heroes Game, Z Day: Hearts of Heroes Gameplay, Z Day: Hearts of Heroes Guide, Z Day: Hearts of Heroes Hints, Z Day: Hearts of Heroes Review, Z Day: Hearts of Heroes Solutions, Z Day: Hearts of Heroes Strategy, Z Day: Hearts of Heroes Tips, Z Day: Hearts of Heroes Walkthrough by Marvin. Bookmark the permalink.